There are many countries all over the world where LGBT people are still persecuted for being themselves. Even in many first world countries, where freedom and equality are expected, gay, lesbian, bisexual and transgender people do not feel safe showing their affection in public. Here in South Africa, the first country in the world to outlaw discrimination based on sexual orientation, I would not feel safe walking down every street in Cape Town (also known as “The Pink City”, one of the gay capitals of the world) holding hands with another man. This unspoken danger, like a crack in the democracy beneath our feet, fills many LGBT people with hypervigilance in unfamiliar neighbourhoods. All we want is to feel safe on our own streets. 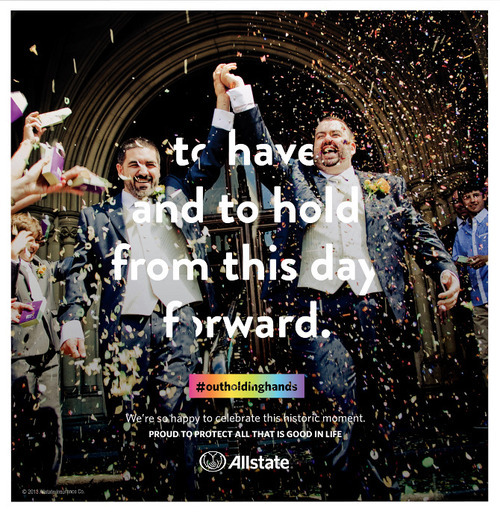 It is this danger and need for safety that American company Allstate Insurance tapped into when creating their latest advertising campaign to coincide with the legalisation of gay marriage. I love the photos and payoff lines they used in the posters below. It was a very shrewd marketing move that will improve their chances of the ads being spread all over social media, as well as emphasise their value proposition as an insurance company that keeps you and your assets safe. This post was not sponsored by Allstate Insurance. I seriously just like the ads. This entry was posted in LGBT and tagged advertising, fear, gay marriage, gay rights, LGBT, LGBT rights, love, marketing by darylhb. Bookmark the permalink. I think that when it comes to the context of South Africa, my time spent living in Cape Town demonstrated that I didn’t really ever feel safe. Even with my host brother who was 21 guiding me around outside of the family compound equipped with a gun I felt uneasy, and I got the impression so did he to a certain extent. So when it comes to LGBT community in that area, I doubt any of it had to do with fear of persecution, but rather a generic fear. I can only hope that people in general all over can feel more safe with being honest and not be persecuted for their love. I am also hoping for a future where everyone will be free to love whomever they do. I must admit, I’m not sure which part of Cape Town your host family lived in, but my friends and family and I don’t carry (or own) guns. Many of our homes have been robbed (in most cases while the houses were unoccupied), but we don’t generally feel unsafe out and about – except of course those of us who are gay and have been victims of homophobic verbal and/or physical abuse.